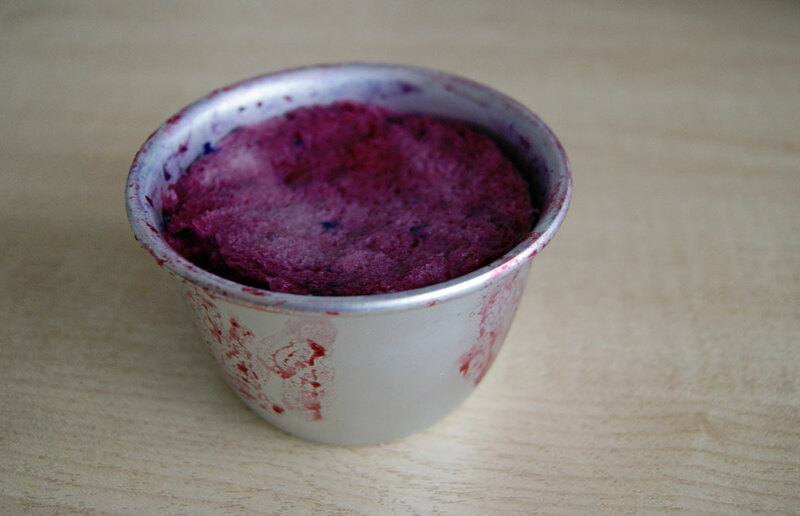 Summer pudding has long been a favourite of mine and it was a staple in the dessert rotation when I was growing up. My parents were keen gardeners and Mum still grows lots of her own fruit and vegetables despite not having much time to devote to the garden. On a Sunday afternoon I would often be dispatched up the garden to pick raspberries, strawberries, tayberries and blackcurrants for one of Mum’s spectacular puddings. I always find it a sad farewell to summer when the berries come to an end. 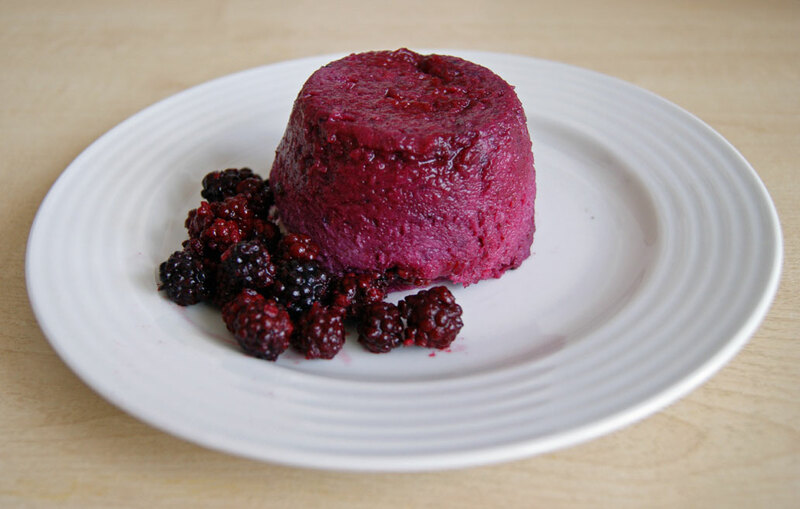 This year, inspired by a Valentine Warner recipe, I decided to extend the Summer pudding into Autumn and make the most of the wild blackberries and the remaining little bit of last year’s sloe gin. I toyed around with calling these Autumn puddings but I like it when the name of the recipes tells you a little about what’s inside, especially when there’s gin involved. This weekend is purportedly the latest you can leave it to go and pick blackberries before the devil does various nasty things to them. If you take your folk law with a grain of salt then you’ll probably be fine going picking after the 29th since this year’s crop seems to be quiet late to ripen. Doubtless round these parts we’ll still be taking empty ice cream tubs out on our country walks well into October. 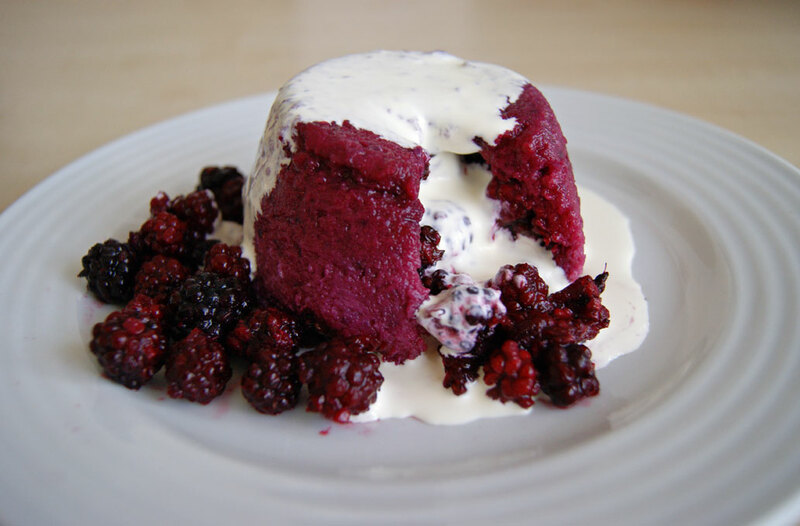 Wild blackberries are unsurpassed in their flavour – a subtle floral ripeness that you just don’t get in the pumped-up domestic varieties – they make this little pudding sing so do use them if you can. That said, sometimes the wild ones, due to the vagaries of the elements, can be a little pippy especially if it’s been a dry summer. If you are concerned that your fruit is one the small side and not very plump I’d recommend substituting a few shop bought ones (no more than half so the flavour isn’t lost) to avoid an unpleasent texture and bitter taste. Grease 6 x 150ml pudding molds with a little flavourless oil. Peel and core the apples and chop into small pieces. Please them in a pan with 50ml water and cook over a medium heat for 10–15 minutes until they break down an become fluffy. Spoon the apple into a bowl and set aside. Rinse the blackberries and pick out any bits of leaf or stalk. Place in the pan you used for the apples with 100ml water, 50ml of sloe gin and the sugar and bring to a boil. Cook for 5 minutes until the blackberries start to soften and produce juice but retain their shape. Pour into a sieve set over a bowl and strain out the juices. Stir the blackberries into the apple and taste for sweetness. They will taste slightly less sweet when chilled. Stir the remaining sloe gin into the reserved juices. Cut the crusts off the bread and cut into thin slices, about 4mm (just less than ¼ inch) thick. With a circle cutter or clean glass cut out 6 circles the same size as the bottom of the pudding molds and 6 larger circles to fit in the top. Cut the rest of the bread into rectangles to cover the sides of the molds. Dip the bread a piece at a time into the gin and juice mix and line the pudding molds. Divide the blackberry and apple filling between the 6 molds pressing firmly down. Dip the large circles of bread into the juice and press down onto the filling. Cover with cling film and place a weight on top of each pudding (I use ceramic baking beans). Chill for at least 6 hours or overnight. Before serving run a knife or bendy spatula around the edge of each pudding and turn them out on to dishes. Serve with thick cream.